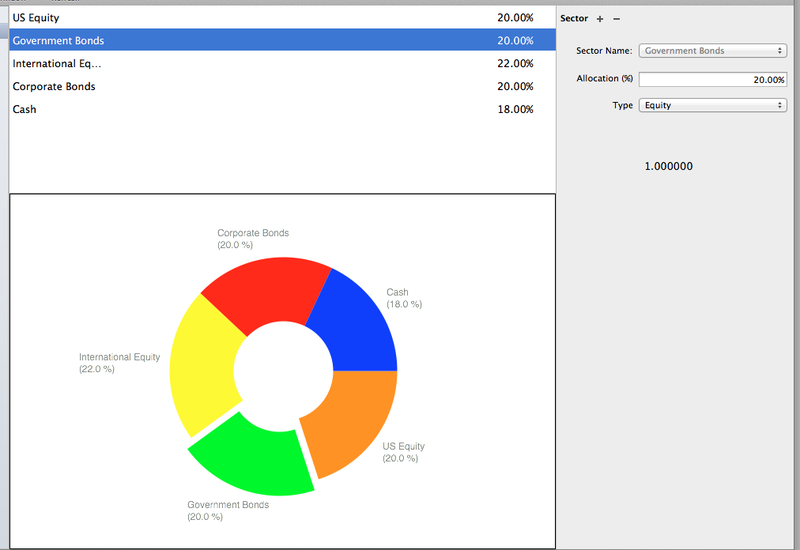 I'm working on a OSX desktop application for rebalancing investment portfolios. 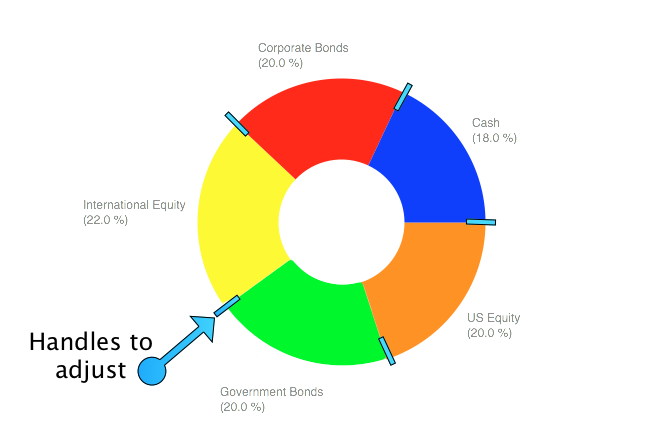 I have a screen where the user can input his desired target allocation for different sectors (US equities, Bonds, cash...). The user can have as many sectors as they like with varying percentages. However, the total percentage obviously has to be 100%. Currently, I just have a running total displayed, so the user can see where there are in relation to 100 and a I display an alert if exit the screen without a 100% total. But, there must be a better way to remove the burden from the user. Any ideas how to easily maintain a 100% total, while adding and/or adjusting sectors? Two thoughts that come immediately to mind is to include a slider that is always at 100%, and allow the user to adjust the size of different segments. Allow the user to add, or remove, segments as needed. Another option might be to do the same with your graph. A slider plus a pie chart is visually busy, so why not combine the two? Be careful of adding too much visual clutter. The bar line is more straight forward for adjusting and more traditional for adjust values (I've noticed others suggested the same while I was playing with graphics), while a pie chart might be more traditional to show percents of a 100% group. If you include both you are duplicating information in very graphical ways, which may not be a help to the user. Maintaining 100% will be impossible without adjusting other sectors any time the user changes something. That is likely to be confusing. Perhaps you could use visual feedback to show the unallocated amount or overflow. Instead of a pie chart, show a progress bar with a segment for each amount. If the total is less than 100% show the unallocated amount at the end. If it is greater than 100% show the overflow. Make sure they are visually distinct from the other segments and from each other. The white dots (could be replaced with some more intuitive symbols) would be draggable and as in the result, the range's values would change. Optionally, clicking on a value would make it an editable textbox (this, however, would require some extra logic regarding maximum value so the range won't cover it's neighbors). This makes it easy to precisely control each range and each change influences only one neighbor, so this is pretty predictable for the users. Part of the issue with the text fields is that they can be annoying to use, Adobe After Effects has a clever UI where if you click and drag left and right on a number field, it increases and decreases that number so you don't have to type or click little up and down arrows. Not the answer you're looking for? Browse other questions tagged forms user-behavior mac-os-x or ask your own question. How would you display a key equivalent to the user? Is there a better way to show 3 states of 2 types of data? How would you solve the accidentally-launching problem of the Mac OS dock? I have a complicated system resulting in three tasks with a high degree of interoperability. How can I design an interface for this? How can I improve this GUI interface? How to present a usable checklist with 100+ items plus descriptions to a user? What is a good way to display infinite recurring decimals in Form Fields?